On May 14, North Korea flight-tested a new ballistic missile, the Hwasong-12. This missile was first revealed during the April 15 military parade commemorating Kim Il Sung’s 105th birthday, and has since been the subject of much scrutiny as North Korea watchers try to assess its dimensions and capabilities, as well as what it contributes to the North’s overall ballistic missile program. At a first glance, the successful flight-test of the Hwasong-12 appeared to have implications for North Korea’s efforts to develop an intercontinental ballistic missile (ICBM), but to what extent is still unclear given the limited information available. In this article, I have run computer simulations to help assess the missile’s range and performance. The missile’s parameters were estimated based on close examination of the available photographs and missile trajectory, with a large focus on engine performance. Based on the results of the simulations, it would seem that the Hwasong-12 is simply a larger variant of the existing Hwasong-10 or Musudan intermediate-range ballistic missile (IRBM) with a similar engine and a lighter construction, offering only slight gains in range but with limitations on mobility. While the new missile may serve as a testbed for some of the technology intended for an ICBM, the flight-test did not provide evidence of a major step forward in North Korea’s ICBM program. North Korea has displayed supposedly road-mobile ICBMs, known as the KN-08 and KN-14, during past military parades, and while Kim Jong Un announced in his 2017 New Year’s Address that the country was close to being ready to flight-test an ICBM, no test has taken place to date. The most powerful rocket that North Korea has flight-tested is its Unha-3, which was used to successfully launch small satellites into orbit in 2012 and 2016. In 2006, an attempted launch of an ICBM based on this rocket, known as the Taepodong-2, ended in failure; the Taepodong-2 is also too large for mobile use. The Unha-3 uses four Nodong engines for its first stage; a smaller missile with an intercontinental range will require more advanced rocket engines. So far, the most powerful liquid-fuelled engine that North Korea is known to have flight-tested is the engine used in the Hwasong-10 or Musudan IRBM. This engine is closely related to the one used in the Soviet R-27 submarine-launched ballistic missile (SLBM). By itself, it does not have sufficient thrust to lift the mass of an ICBM, so using this type of engine for an ICBM would require combining at least two of them. However, because the R-27 engine was uniquely tailored for use in a very compact SLBM, building a rocket stage that incorporates two is an immensely complicated task. Photographs of ground tests of what appear to be two R-27 engines mounted very close together were published in 2016, but this combination does not appear to have been test-flown. Some experts speculate that the engine used in this test was the new engine North Korea tested in March, but it is difficult to confirm this based on the photographs alone. Additionally, North Korea has yet to demonstrate a working re-entry vehicle (RV) with a heat shield suitable for an ICBM. An ICBM’s RV enters the atmosphere at a much higher velocity than North-Korea’s known IRBMs and is therefore subject to much higher temperatures and stresses that cannot be fully replicated in ground tests. Flight-testing an RV design on the trajectory flown by the Hwasong-12 could provide more realistic conditions, but a truly convincing demonstration would have to involve even higher velocities. 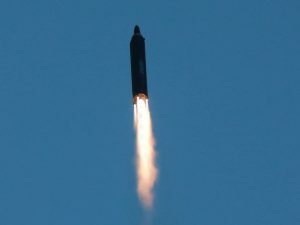 During the test-launch of the Hwasong-12, the missile reportedly flew on a lofted trajectory, covering a range of in roughly 30 minutes and reaching apogee at an altitude of 2,000 km. This performance has led to speculation that the missile is closely related to North Korea’s efforts to build a road-mobile ICBM, and it may have indeed used the engines intended for this. Based on photographs of the test released by North Korean state media, the Hwasong-12 appears to be a single-stage missile powered by a single large engine coupled to four vernier engines (see Figure 1). A single uninterrupted cable raceway is clearly visible on the outside of the missile, running from just below the re-entry vehicle towards the engine compartment at the bottom. This routes wires connecting the guidance system to the vernier engines along the outside of the propellant tanks. If the missile had multiple stages, one would expect the raceway to be interrupted near the location where the stages separate. Figure 1. The May 14 flight-test of the Hwasong-12. To assess the Hwasong-12’s performance, I have run computer simulations of its trajectory. Parameters were estimated based on available photographs and baseline parameters of the Musudan. The diameter of the missile is similar to that of the Musudan at roughly 1.5 m, but it is longer and slightly flared at the base. Including the warhead, its approximate length is 15.7 m. The booster length is approximately 12.4 m. I assume that the single main engine is essentially an R-27 engine, as flown in the Musudan, but with the addition of two more verniers. This leads to a small increase in the mass flow and thrust. For the propellant, I assume dinitrogen tetroxide (N2O4) as the oxidizer and unsymmetrical dimethyl hydrazine (UDMH) as the fuel, with corresponding values for the specific impulse—a measure of the fuel’s effectiveness. This is the same propellant combination as used in the R-27. 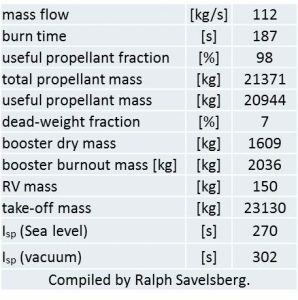 The length of the missile allows estimating the propellant volume and propellant mass, leading to the parameters in Table 1. Simulations of the lofted flight of the Musudan, in June 2016, showed that this was most likely flown with an empty re-entry vehicle, with a mass of 150 kg for just the empty heat shield. I assume that this was the case for the Hwasong-12 as well. The model for calculating the trajectory is the same as that used for the earlier analysis of the Musudan. Figure 2. Frame by frame photos of the Hwasong-12 flight test. Table 1: Parameters of the Hwasong-12 used in the simulation. With these parameters, a lofted trajectory over a distance of 700 km was simulated, with a launch originating from Kusong. The initial heading was 70 degrees. The simulation includes the effects of Earth rotation. The maximum altitude reached during the flight is 2,000 km and the total flight time is close to 30 minutes, both similar to the reported values. The simulated trajectory is shown in Figure 3, and a visualization using Google Earth is shown in Figure 4. Figure 3. Computer simulated lofted trajectory. In order to obtain this performance, the structural mass of the booster had to be reduced to 7 percent of the total booster mass. The lengthening of propellant tanks tends to decrease this number, but its low value means that the construction of the propellant tanks is unusually light. The equivalent number for the R-27, for instance, is closer to 10 percent. The use of a TEL to transport the Hwasong-12 suggests that it is meant to be a mobile weapon, but given these parameters, one can expect the missile airframe to be quite fragile and unsuitable for transport and erection with propellant inside. This means that the missile would have to be fuelled after being positioned vertically on its launch table, which dramatically increases launch preparation time. The presumed N2O4 oxidizer also has a very limited temperature range in which it can be safely stored and used, further limiting the missile’s usefulness as a mobile system. Inhibited fuming red nitric acid (IFRNA) could serve as an alternative oxidizer since it is easier to handle safely, but this would result in a lower specific impulse. Therefore, if the Hwasong-12 had used IFRNA, it would not have had sufficient thrust for the trajectory it flew during the flight test. Figure 4. Visualization of the lofted trajectory reportedly flown by the Hwasong-12 in Google Earth. The lofted trajectory of the test flight is atypical for a ballistic missile. However, the Musudan, during its single successful flight in 2016, flew a similarly lofted trajectory over a distance of 400 km, reaching an altitude of more than 1,000 km. The Hwasong-12 flew both farther and higher. Consequently, if it were to be flown on a minimum-energy trajectory, which maximises the range, it can cover a longer distance than the Musudan. 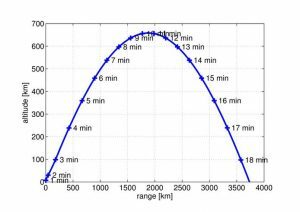 With a payload of 650 kg (equivalent to the payload of the R-27, including the heat shield, but likely lighter than a North Korean nuclear warhead), its simulated maximum range is more than 3,700 km (on a 70 degreeheading, including Earth rotation) (see Figure 5). Provided that North Korea has a sufficiently accurate guidance technology, this would theoretically allow the Hwasong-12 to reach Guam, at a distance of roughly 3,400 km—a target that cannot be reached by the Musudan. In the simulation of the lofted trajectory, the velocity during the re-entry peaks at 5.4 km/s. This is only marginally higher than the maximum of 5.2 km/s reached in the simulation of the minimum-energy trajectory. Therefore, testing a new heat shield for the re-entry vehicle is not a likely explanation for the choice of a lofted trajectory. The more likely reason for this choice is that the missile cannot be flown on minimum-energy trajectories without violating the airspace of other countries in the region, such as Japan. The velocity is a lot higher than the peak velocity reached by the Musudan, however, and is closer to ICBM velocities. Figure 5. 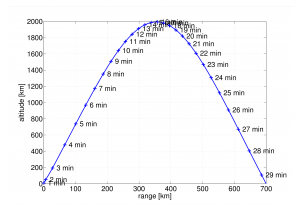 Simulated minimum energy trajectory with a payload of 650 kg. 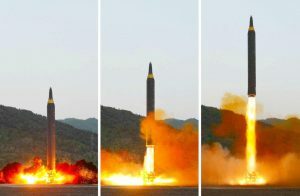 Based on photographs and computer simulations, the Hwasong-12 appears to be a longer, lighter version of the Musudan. However, the main engine is not significantly more powerful than engines North Korea has already test-flown. The missile does have a higher performance than the Musudan, being able to deliver a payload as far as Guam, but its light construction and fuel/oxidizer mix mean that it is ill-suited for mobile use. Additionally, despite its light construction, it is still heavy compared to the thrust of this engine, which means that there is little room for further growth. While the new missile may serve as a testbed for some of the technology intended for an ICBM—for instance the heat shield—the May 14 flight test of the Hwasong-12 did not provide evidence of a major step forward in North-Korea’s ICBM program. 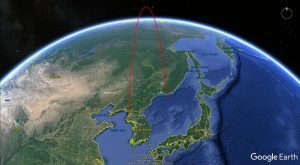 David Wright, “North Korea’s Missile in New Test Would Have 4,500 km range”, 38 North, May 13, 2017, http://allthingsnuclear.org/dwright/north-koreas-missile-in-new-test-would-have-4500-km-range. John Schilling, “North Korea’s Latest Missile Test: Advancing towards an Intercontinental Ballistic Missile (ICBM) While Avoiding US Military Action,” 38 North, May 14, 2017, https://www.38north.org/2017/05/jschilling051417/. It is possible that the missile is a two-stage missile, where the system is largely internal and invisible, but we cannot confirm this with the limited information available. Ralph Savelsberg and James Kiessling, “North Korea’s Musudan Missile; A Performance Assessment”, 38 North, December 20, 2016, https://www.38north.org/2016/12/musudan122016/. John Schilling, “A partial success for the Musudan,” 38 North, June 23, 2016, https://www.38north.org/2016/06/jschilling062316/.